The best defence against Kilometre “K-Day” is to act now against any current metric encroachments, in particular, by purging illegal metric signs from every corner of the United Kingdom. By rolling back the metric conversion of road and pedestrian signs, we can send a message to future governments that we will NEVER accept the use of kilometres on our roads. Anyone can contribute to the campaign against metric signage. All directional signs marked in metres or kilometres, including those for pedestrians as well as motorists. Metric distances on direction signs are unlawful even when accompanied by mile/yard indications. Any sign with metric-only indications for restrictions on traffic width, length and height, so long as there are no corresponding imperial signs alongside. 2) Record the illegality. Having located unlawful metric signs, take photographs for reference purposes. Make a note of the location of the sign (ie street or junction). Survey the locality for further breaches of the law. .
3) Write a letter of complaint to the relevant authority. If the sign is on a local road, write to the transportation or highway department of the county council. Their address will be in the telephone directory under the name of the county council. If the sign is on a motorway or trunk road, write to the Highways Agency at (for England), St Christopher House, Southwark Street, London SE1 0TE. While travelling along [name] Road on [date], I saw a sign near the junction of [road], the giving the [distance/height/width, etc] in [metres/metres-only]. I enclose a photograph for your assistance. distances on signs for [motorists/pedestrians] be described in yards and miles only. Metric units are not permitted. height and width restrictions be described in feet and inches. Metric may also be used, but only alongside, and not as an alternative to, imperial units. While I appreciate these signs may have been erected in error, they are unlawful. 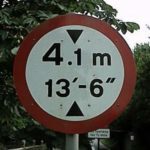 Please can you give me an indication as to when these signs will be replaced with legal signs displaying imperial units. Please also give an assurance that any other metric signs within your authority will also be replaced. Do not enter debates with local councils about arguments for and against metric signage. If a local authority believes that metre signs are beneficial, then it is up to them to have the law changed. Until then, you need only argue that they must comply with the law. IMPORTANT: Regarding pedestrian signs, some councils try to evade their legal obligations by saying these are not distance signs but “information” signs. This as bureaucratic fiction; do not be diverted by this explanation. Signs in metres are illegal and councils have no choice under law but to replace them. Request for Investigation into Unlawful Expenditure by [town/city] Council. The above Council has spent taxpayers money on unlawful metric road signs, that is to say, signs not permitted by the 2002 Traffic Signs Regulations and General Directions. These regulations lay down clear requirements for units of measurement that may and may not be used for signs intended for use by road traffic and pedestrians. The signs in question [give details of type] appear at [give street/junction location]. The 2002 Regulations represent the law of the land and [town/city] Council is obliged to conform with these regulations, just as the public is required to conform with parking restrictions, etc. Local authorities are required to be aware of the law on units of measurement. I would ask that you to consider appropriate financial penalties on those Members and Officers who authorised this unlawful expenditure. Any expenditure not authorised should be met by them and not Council taxpayers. The offence is compounded by the wilful refusal of [officer’s name] to remedy the offending signs, even when the illegality has been pointed out to him [enclose his or her letter]. The purpose of road signs is to communicate information regarding distance and speed to motorists and other users. We have such a system: yards, miles and mph. Metric conversion is therefore not necessary. Metric signs are less accurate than customary signs. For example, using metres to describe the width of bridges (eg 4.4m) achieves an accuracy of only one tenth of a metre, or four inches. 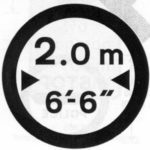 Imperial signs (eg 14’6″) are accurate to one inch. The view that metric signs help Continental tourists is negated by the corresponding lack of help to American tourists. In practice, Continental tourists are often interested by signs showing miles, yards, feet and inches. Altogether, there are 2.5 million signs in England alone, of which perhaps 2 million make some reference to distance or speed. The costs of conversion would be huge. According to Gallup, 95% of people in Britain think in miles compared to only 3% for kilometres. Changing to kilometres would cause misunderstanding, make enforcement of speed limits more complicated and increase the likelihood of accidents.